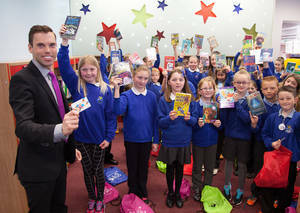 Welsh libraries and primary schools have joined forces to provide every primary school child with a library card – the project started in March 2013 with six local authorities piloting the initiative and, thanks to Welsh Government funding from the Department of Culture, Sport & Tourism, this has now been rolled out to all 22 local authorities targeting up to 35,000 year 4 primary school children. This card will allow children to borrow books straight away. Once proof of address is provided, they can then have access to thousands of free books as well as many more resources to help improve their school work and enhance their leisure time. The final stage of this project has now been rolled out to all 22 local authorities targeting up to 35,000 year 4 primary school children. Scroll down for artwork, templates and online evaluation survey links. The ECALM project was rolled out to another 10 authorities. A total of 16 authorities were involved in the project targeting 25,000 children. Approximately 76% of primary schools in those areas taking part in the project signed up. The evaluation of Phase 2 of the project is now available to download. Over 8000 pupils were targeted by library staff across the six pilot authorities with approximately 76% of primary schools in those areas taking part in the project. The evaluation of the pilot project is now available to download.